This guide aims to decode and encode H.265 codec to H.264, so it can be easily edit, upload or burn on PC and Mac. If you get some H.265 workflow issues, just follow this article to learn how to convert H.265/HEVC to common H.264 which can be easily accepted on PC/Mac. H.265/HEVC, short form for High Efficiency Video Coding, is a video compression standard successor to H.264/MPEG-4 AVC. So HEVC is also known as H.265. However, with this kind of latest codec, though it has the higher definition and smaller size, most NLEs or media player cannot take it well yet. For example, you may usually have H.265 troubles in FCP X, Premiere Pro or WDTV, etc. In this case, it is necessary for us to find a best H.265 encoder/decoder to work the files nicely no matter for editing, uploading or burning on Mac/PC. Notes: If you want to convert HEVC H.265 from video H.264 HD video or other HD video including AVCHD, MXF, MTS, M2TS, MOD, TOD, HD MP4, HD AVI, HD MKV, HD WMV, ProRes can not only reduce file size but also improve quality using the same bitrate. Best H.265/HEVC decoder/encoder is offered here to you! Pavtube Video Converter for Windows/Mac, which has been upgraded to the latest version to support the H.265/HEVC files so nicely. For easily converting the H.265 to H.264, just with several steps, we can do this job well. What’s more, for advanced users, we can do our own settings and adjust our output video parameters as well. Let’s here learn how to decode the H.265 to H.264 with the high original quality preserved. 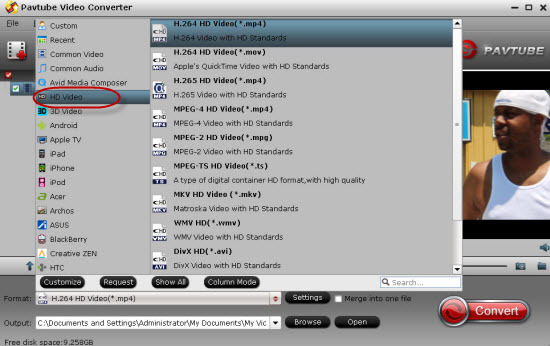 To add source video to the HEVC Video Converter, you can directly drag and drop them into the program window or go to “File” from menu bar and then choose “Add files”. Step 2.Choose right output formats. Then we need to select the best output video formats on the output list. So here in order to get the high definition H.264 codec, we suggest you go to the ‘HD Video’ column t find one as we mentioned above. ‘H.264 HD Video (*.mp4)’ can be the right one there. Finally, as soon as you have chosen the best output format and adjust the suitable video and audio parameters, it’s time to go back to the main interface to hit the ‘Convert’ to start the conversion. From H.265 to H.264, which can work well on PC/Mac, we can make the right decisions!